Last year, University of Exeter Centre for Ecology and Conservation MSc. 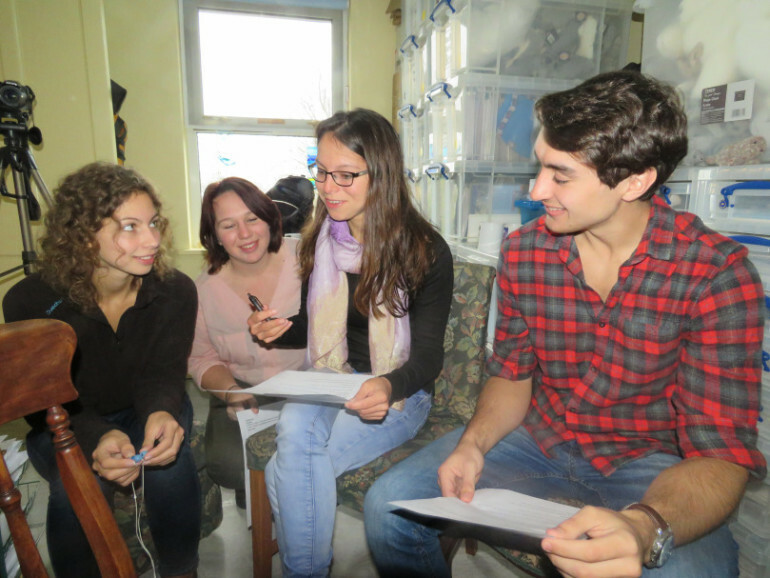 students set up a really cool group called The Natural Selection, where they interviewed university bioscience researchers about their recent work and made it into podcasts. However they all graduated in September and so when the new cohort of students arrived they jumped on us to see if we wanted to carry it on, and we jumped back saying yes (because of course who doesn’t want to make podcasts?). Plus it was a great opportunity for us to stay on top of University of Exeter’s new research, and we got the chance to talk to our lecturers and other staff in the department. People’s eyes always light up when they talk about their research, and it’s never dull talking to them about it. So after practicing with the dictaphones to make sure we knew how to turn them on and record the interview (because nobody wants to do an entire interview only to realise they’d forgotten to press ‘record’), we selected our interviewee – Sue Sayer. Sue founded the Cornwall Seal Group in 2000 and it has now become a huge citizen science project that runs along the entire Cornish coast. 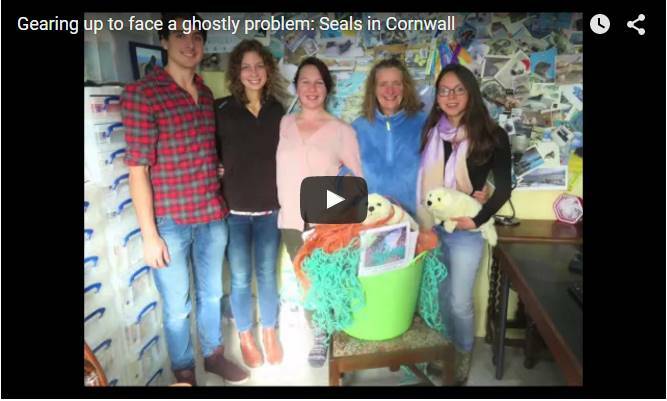 Whilst this wasn’t strictly a University of Exeter research podcast, the Cornwall Seal Group works with several researchers at the university on marine mammals. As part of the Seal Group, volunteers spot seals along the coast and take a photo, sending them in to Sue where they are identified and entered into a large database so that researchers can see how individual seals move along the coastline. 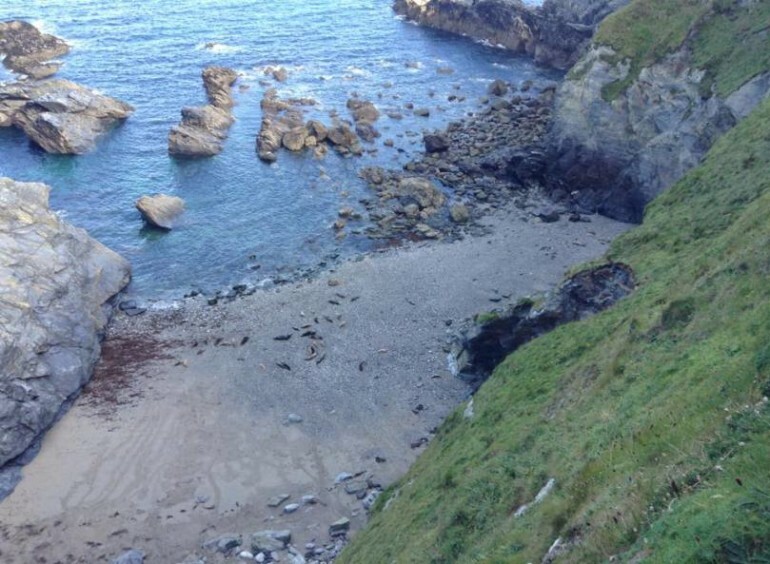 The Cornwall Seal Group has now expanded to include both land and boat marine surveys, in order to collect information on other marine life and how they use their environment. Although for the purpose of our podcast (we try and keep to around 10 minutes) we focused solely on seals. Sue was keen to talk to us and we were super enthusiastic, so we were well matched together. We interviewed her about grey seals, about her photo identification method, and about the effects of ghost gear on seal populations. So to break that down, Sue spoke firstly about grey seals, a globally rare marine mammal, that can be spotted around the Cornish coast. We then moved on to talk about photo identification, which is a really clever way in which Sue can ID a seal from a photo (based on its unique fur pattern) and then track the seals movements. It’s a really simple, easy method, but it only works because Sue is so fantastic at recognising seals. She can recognise over a 1000 seals on sight, which I find so impressive! I don’t even know if I could recognise 1000 humans by sight. The third part of our podcast focused on ghost gear. Put simply, ghost gear is any type of fishing gear that is lost or abandoned in the sea, for example nets, pots and ropes. Globally, 640,000 tonnes of fishing gear are lost every year, and it poses a huge threat to all marine mammals, turtles, fish and birds as well as seals, as these animals become tangled and eventually tire and die. Sue talked about the global ghost gear initiative which was set up this September; it has brought together fishing industries, governments, academics and charities in order to review the policies surrounding ghost gear and hopefully find a solution to prevent the deaths of more marine animals. Since 2000, the Cornwall Seal Group has found 262 live seals entangled in fishing gear, a number which will hopefully be reduced in the future with thanks to the global ghost gear initiative. This is a good thing, and I’m hopeful for the future! Following our interview we went up the coast slightly for a spot of seal spotting. We’d timed it just right, the tide was about halfway, and we managed to see around 40 seals basking on the beach. It was the perfect spot for the seals, we couldn’t climb down to the beach and there were too many rocks to access it by boat. Seals do suffer from high levels of disturbance here (up to 10 times in 70 minutes), so if you do go, please only talk in whispers! Keep a low profile on the horizon as seals can smell, hear and see you on the cliff top. September to December just happens to be pupping season too, so there were plenty of smaller pups on the beach (the slightly smaller blobs on my photo below!). We’ve also recently created a website, so if you’re interested in our future podcasts you can find us here. We’re in the midst of marine month at the moment, so keep an eye out in the next few weeks for more podcasts on topical marine research. Thank you to the podcast team Zoe Courchene, Alex Hadley, Becky Hollely and Genevieve Labrum – especially CSG member Zoe who made all the arrangements and Becky who wrote the blog post. CSG are hugely grateful to the University of Exeter’s (Penryn) Professor Brendan Godley from the the Centre for Ecology and Conservation and Dr Matthew Witt from the Environmental Sustainability Institute.